Image: "CatinHat" Courtesy of jtrummer. An amazing library located at the University of California-San Diego. 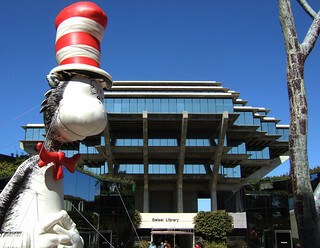 Formerly known as Central Library, the Geisel Library was renamed in 1995 in honor of the generosity of Audrey and Theodor Geisel (Dr. Seuss). 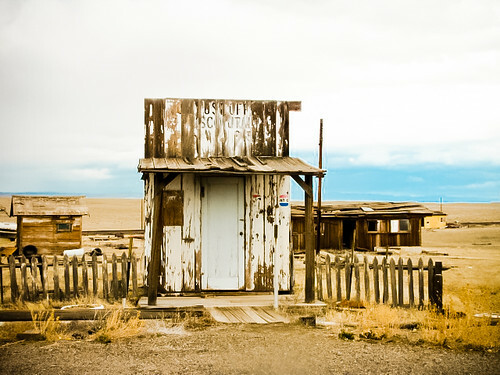 Image: "Cisco Post Office" Courtesy of Kazz.0. The debate over the relevance and viability of the United States Postal Service and how to stop the USPS' massive borrowing to stay afloat is far from over. In May, the U.S. Senate stopped a House-backed bill to begin closures of primarily rural post offices. Instead, they opted to reduce the post offices' operating hours and move full-time employees to part-time. Yet, some lawmakers believe that isn't enough (Bingham, 2012). A. Lee Fritschler, a professor of public policy at George Mason University and former chair of the U.S. Postal Rate Commission, argues the primary role of the USPS has shifted from communication to a medium for broadcasting advertising (Moe, 2012). The adoption of technologies such as the Internet and telephone have brought about that shift. Libraries face the same challenges. Libraries, for the most part, have taken a passive role in the creation of technologies to address people's information needs. Instead of taking a major role in computer sciences, libraries focused on being a service provider--a mediary reliant on others to create information systems. The mass adoption of information systems that are also providers (e.g. Google) erode libraries' relevancy. Publishers who can control pricing tiers to different customers as well as who they sell to (e.g. ebook publishers) threaten libraries' relevancy. I used to think the debate over the death of libraries had no merit. People will always have information needs. Libraries offer platforms for the exchange of information, debates, performance, and community development. Libraries are beacons for fostering intellectual freedom. Libraries moved away from being book warehouses whose goal was to instill acceptable social norms and behaviors. Instead, they've placed greater resources on consultancy models that help information seekers effectively navigate massive amounts of data. However, as information systems become more sophisticated and are able to provide more relevant results to information seekers' queries, the role of the librarian will be diminished. As publishers create an atmosphere hostile to library acquisitions, libraries' ability to serve their communities' needs will be diminished. As budgets strain, services such as hours of operation and community services will diminish. As libraries increasingly move towards not hiring/replacing professional librarians and hire capable para-professionals and part-time employees, the library profession as a whole will be diminished and library/information science schools will begin to close. Some arguments for the death of the libraries have indicated that the library will just morph into something that can't currently be foreseen, but, what if, the library dissipates into the ether? The library no longer exists--the library is everywhere. I'm thinking about the virtual librarian in Neal Stephenson's "Snow Crash." The book's librarian is a piece of software visualized in a virtual 3-D environment. While not able to deduce, the librarian asks qualifying question (much like a reference interview) to "understand" the semantics of its patrons' queries. The librarian can access sheer amounts of data very quickly. Now imagine having this librarian at your disposal at any time in any place. The United States Postal Service is economically unhealthy, currently unsustainable, and did not adequately transition to meet the needs of the public. Can we say differently about libraries? Image: "Integrated Marketing: Lady Gaga's Workshop at Barney's New York. #gagasworkshop" Courtesy of Robert Raines. I was thinking about the stores-within-stores concept that I originally learned about at Fitch, and I wondered if there was anything like that in the library world. I was curious how this might be different that just areas set aside for a particular subject area (like LAPL's children's lit department). A Store-within-a-store "is an agreement in which a retailer rents a part of the retail space to be used by a different company to run another, independent store" (Wikipedia, 2012). So, what if the library rented space out to another non-profit like a historical society or to a a for-profit like a publisher that is library/e-book friendly? In searching, I didn't find any concrete examples (read: opportunity! ), but I did come across the National Library Board of Singapore's "unlibrary." In essence, they created nodes within the library that subverted physical/virtual space and adopted means that challenge the traditional knowledge transference from book to person (i.e. "living library" or "borrow a person" concept). PSFK has a nice post on stores-within-stores here. Stefano Arienti: Library - installation video from Lehmann Maupin on Vimeo. Artist Stefano Arienti "transforms his source material through a minimal gesture (like folding or puncturing) that he repeats systematically, almost obsessively. In doing so, he subverts the visual cliches of popular culture." I like in this piece, called Library, Arienti encourages the viewer to explore and discover. Mashable has a recent post on the 30 most popular passwords stolen from LinkedIn. In the post, Samantha Murphy wrote, "Number sequences such as '1234' and '12345' also made the list." I couldn't help but think of the scene in the movie Spaceballs where the secret combination of 12345 is revealed.